Eco Friendly Youtube Channels List. The Best Eco Friendly Youtube Channels from thousands of top Eco Friendly Youtube Channels in our index using search and social metrics. Data will be refreshed once a week. About Youtuber Hi, I'm Kate Arnell! Nice to meet you. I've been living a zero waste lifestyle in London for nearly 4 years and this is my YouTube channel where I get to release my inner eco-enthusiast.I'm super passionate about zero waste, choosing organic, eco fashion, seasonal food, exploring and eco friendly alternatives. About Youtuber Join me in building a sustainable, ethical, and minimal wardrobe. I believe in "buying less but better" and make videos about sustainable fashion, capsule wardrobes, natural beauty, and simplifying. I hope to help you create a conscious style you love! About Youtuber My name is Manuela and I have a passion for Sustainability and the Environment. I choose to live my values by living a zero waste, minimal, plant based life with intention. I believe in being happy and doing more of the things you truly love. This channel is a place to inspire and educate others on how to be better versions of themselves- to live sustainably and consciously. About Youtuber Changing the way we think is the most difficult and necessary challenge for our species right now. It's like the old adage that says that "fish don't know they're in water." This channel is dedicated to exploring and sharing these new ways of thinking. About Youtuber Sustainable fashion videos! Follow along as I learn more about being a conscious consumer - whether that be through clothes, food, or the daily routines in my life! About Youtuber Hello! Join me on my journey towards living a waste free, commonly referred to as zero waste, lifestyle. About Youtuber SUBSCRIBE for eco-friendly living videos - from responsible travel and sustainable fashion to vegan food. I bring out new content every Friday! About Youtuber Feel beautiful. Live beautifully. All of our products are made from earth-friendly ingredients to help you look good and feel good about it. About Youtuber Hey guys, my name is Elli and here on this channel I wanna share my passions about minimalism, traveling and living a sustainable, eco-friendly happy life! I’m a passionate minimalist traveler who wants to experience life to the fullest. Over time I became more interested in minimalist living and the simplicity of owning less. About Youtuber A family journey to Minimalism, Zero/Low Waste & Ethical, Sustainable living.My name is Kate and it's a pleasure to share my journey to living a simpler, greener life with you. No extreme measures here, just one step at a time! About Youtuber I'm Amy from Ireland. I follow a plant-based or vegan diet and through this channel I would just like to inform people about veganism and hopefully inspire others to make positive changes in their lives to help themselves, the planet and the animals! About Youtuber Zero Waste, Veganism, DIY Projects, Raw & Vegan Recipes, Healthy Eating/Living, Products & Businesses Reviews. EcoPeaceful is a combination of words Eco & Peaceful (nonviolent). About Youtuber Our vision and mission are simple – create a community that helps consumers find their own shade of green, adopt environmentally sound practices and drive impactful environmental changes. We are here to deliver a mix of targeted media content and recycling data so that you can live a happier, healthier, sustainable lifestyle; one that protects this wonderful planet we all call home. About Youtuber Dedicated to all things minimalist, green/eco friendly, zero waste and vegan. I'd love to get to know like-minded people so please subscribe and comment. If you have a similar channel you think I'd be interested in please let me know so I can subscribe to you too. About Youtuber Fashion and Beauty Channel by sustainable Vegan fashion designer, Lina Mayorga. About Youtuber Monica Richards is an Eco-Baby Expert who is on a mission to keep your Little Ones safe in the only environment you can control - your home! With Eco-friendly products and beautiful nursery design for Baby, as well as natural beauty and green lifestyle hacks for You, Monica's flipping your home into a chic, healthy one. Because Healthy equals Happy, and Happy starts at Home. About Youtuber Hi, I am Carolyn and I live in Cape Town, South Africa. This channel is about everything earth-friendly. I will be learning and documenting my experience with raw foods, permaculture, zero waste, minimalist living and learning to enjoy this world while treading lightly. About Youtuber Watch the latest Green Divas videos for fun and low-stress ways to live a deeper shade of green. Everything from tips for green living, eco-travel and cooking delicious, healthy food... to wildlife, eco-sexuality and taking action for the earth. Hosted by Green Diva Megan McWilliams, with appearances by Green Diva Lynn Hasselberger. About Youtuber Biome is all about saving the planet and your health. With videos about zero waste products, natural beauty, DIY recipes, and reviews, you’ll be more informed and excited to lead an eco friendly lifestyle. About Youtuber Environmental engineer and eco-living educator on a mission to make green mainstream! 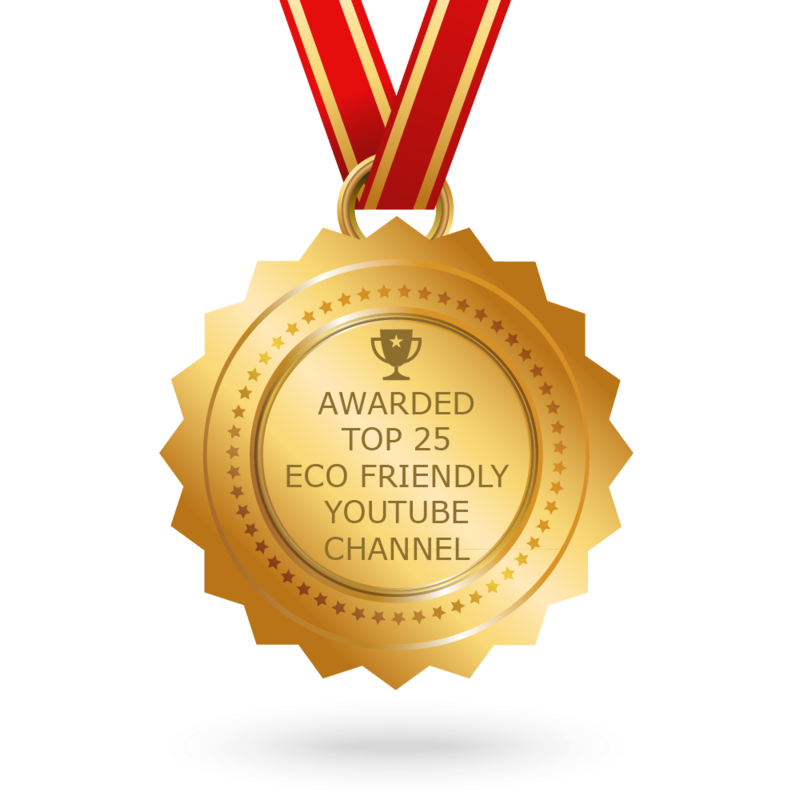 CONGRATULATIONS to every youtuber that has made this Top Eco Friendly Youtube Channels list! This is the most comprehensive list of best Eco Friendly Youtube Channels on the internet and I’m honoured to have you as part of this! I personally give you a high-five and want to thank you for your contribution to this world.